Need a good horror story for the beach? Recently, I had the good fortune of visiting beautiful St. Augustine, Florida with my family. 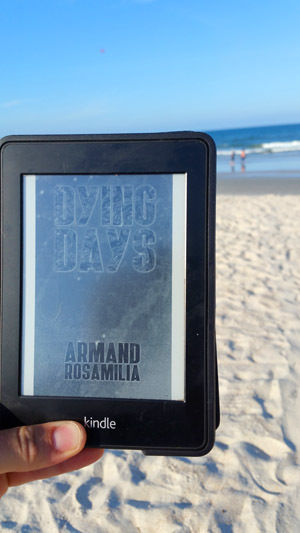 I’d been meaning to read the first novel in Armand Rosamilia’s zombie horror series, Dying Days, for a few months, and this vacation provided the perfect opportunity. I read Dying Days on St. Augustine beach, where much of the book’s zombie-induced chaos takes place. Dying Days, you see, is set along famous A-1-A near St. Augustine (or, at least, a healthy portion of the story is set in this area). What better setting for the zombie apocalypse than the idyllic beaches of Florida’s space coast? The story line follows Darlene Bobich, an immensely likable and believable protagonist. Easy to cheer for, Bobich gets herself into one horrendous predicament after another, her character growing and becoming wiser as the apocalypse unfolds. I enjoyed Dying Days quite a bit. It was easy to imagine the hollowed-out condos and hotels lining the beach, the ghost of Jimmy Buffett singing on the wind about boat drinks and margaritas as the dead shambled after Darlene and her fellow survivors. I ate every last morsel of Dying Days’ nastiness in three short days, beginning on the very beaches of St. Augustine and finishing two days later in Orlando after our vacation shifted westward. By the book’s end, I’d come to fear humankind as much as the undead. Visiting the actual locations where much of the madness of Dying Days takes place added to the enjoyment, so I particularly encourage you to give Rosamilia’s book a read if you are headed to a beach this summer. Dying Days: Two thumbs up, highly recommended.